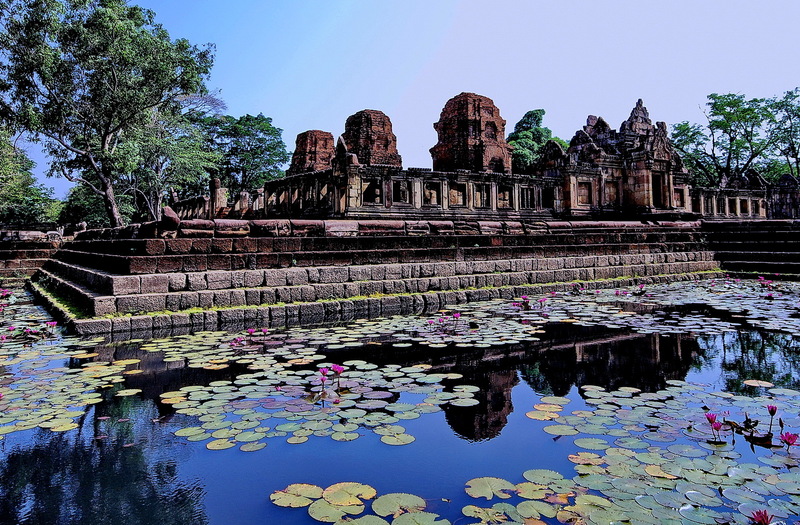 Unusually, one of the most spectacular and best preserved of all Angkor period temples isn’t even in Cambodia. 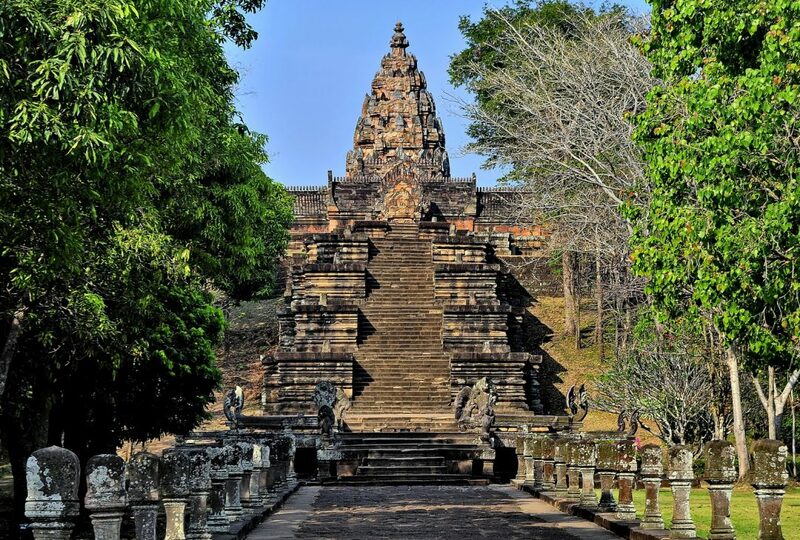 The magnificent 12th-century site of Phnom Rung, spectacularly perched atop an ancient volcano, is actually situated in northeastern Thailand’s Buriram Province. 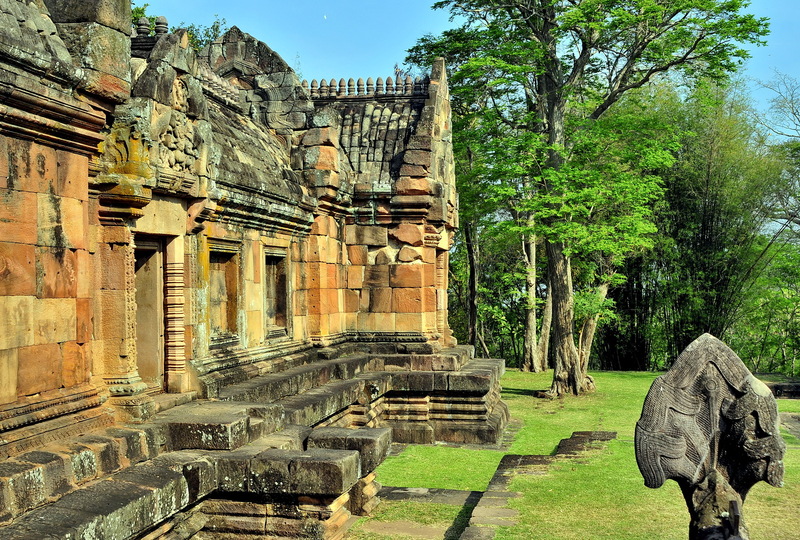 Furthermore, one of the most attractive – and also remarkably well-preserved – ancient Khmer sites, Muang Tam, lies just a few kilometres to the southeast. Quite why these sites haven’t been judged worthy of UNESCO status is beyond us but for now they remain relatively little-known and, outside of weekend local visitors at the former site, are pretty much devoid of tourists most of the time. 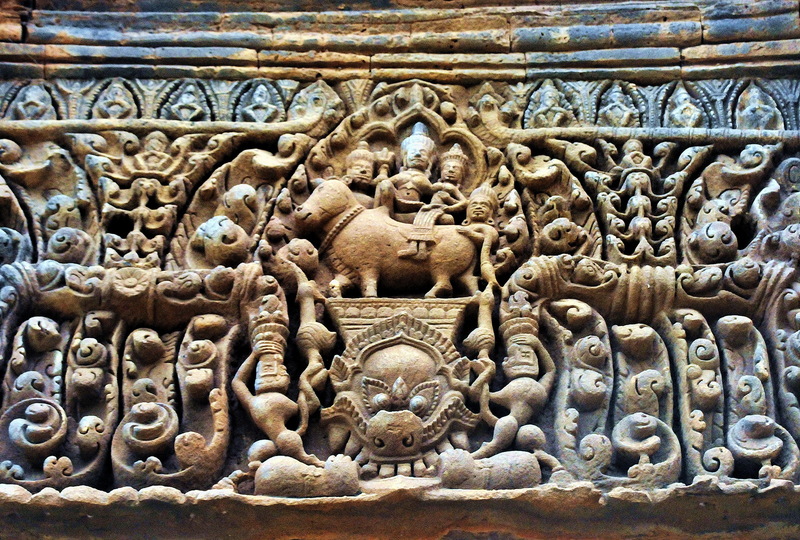 Much of what you see today at Phnom Rung dates to the reign of Suryarvarman II and is therefore contemporary to Angkor Wat itself, although the site had certainly been occupied for a long period prior to that. 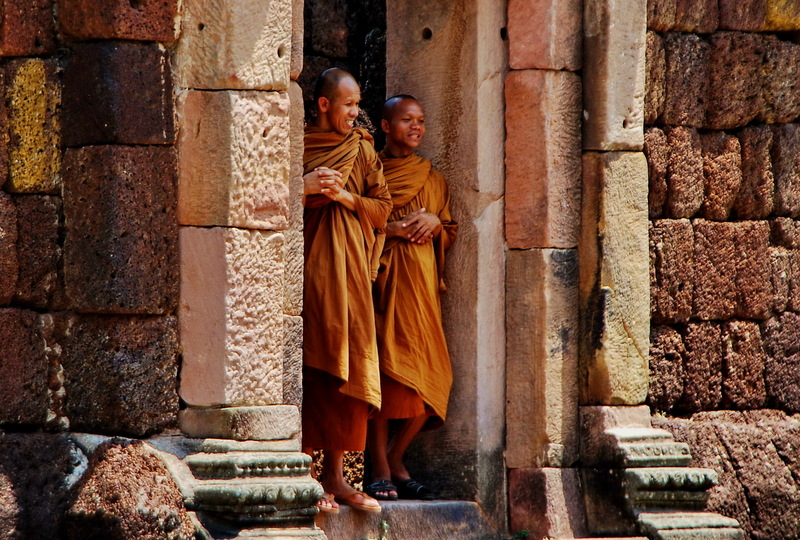 Muang Tam’s final form is much older dating to the late 10th and early 11th centuries. 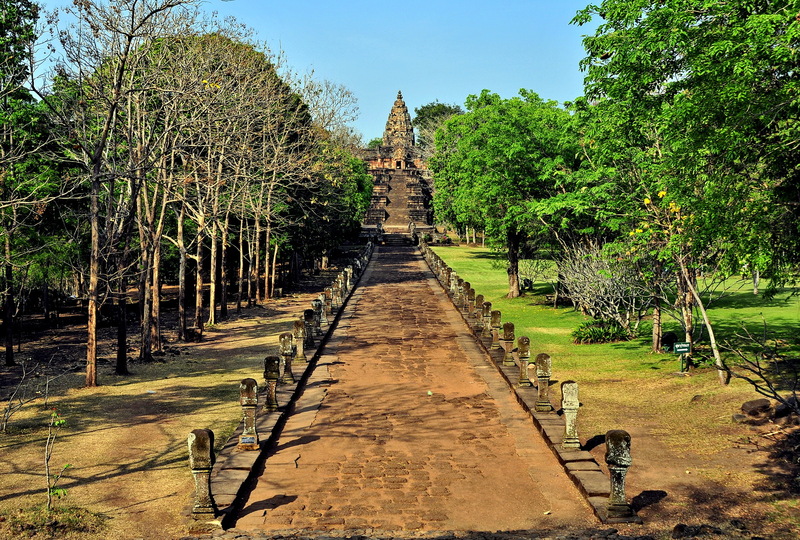 Both temples are largely intact and feature a host of pristine carvings and reliefs. To be fair, Thailand does have a major advantage over neighbouring Cambodia in that the country (and of course its historical sites) never suffered from years of civil war, poverty and brutal regimes so such archeological sites have only seen natural wear and tear and the Thai government has had far more time (and money) to work on preservation and conservation. Our day tour of the region starts early after a night sleeper train ride from Bangkok and we take in Phnom Rung, Muang Tam and a 3rd temple site of Ta Muan actually lying in no-mans-land between Thailand and Cambodia before heading into Surin City for our night’s accommodation. 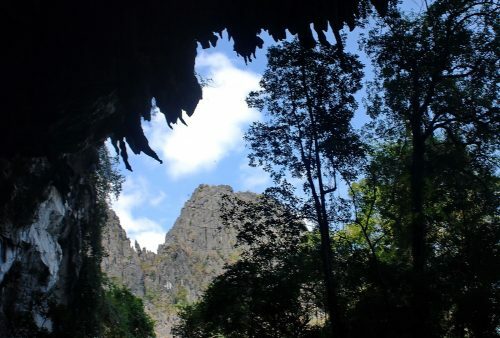 There’s plenty more to see in this remote part of Thailand aside from temples though and our Emerald Triangle tour proceeds from Surin to the cute Mekong-side town of Khong Jiam where we’ll hike to visit the unusual rock formations and famous cliff paintings of spectacular Pha Taem National Park. From here the tour continues across the border into southern Laos and the picturesque Boloven Plateau and 4,000 Islands region. 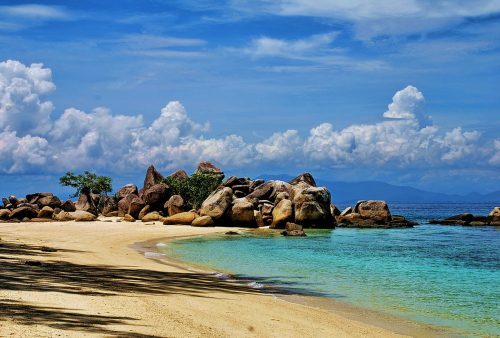 A fascinating, highly scenic and yet little-known part of Southeast Asia. Mark has over 25 years experience in Southeast Asia, including several as researcher for guidebooks before setting up Gecko Travel, now All Points East, in 1999 with sister Lesley as a result of a bet with a mate in a South London pub.